Also gab ich „Farm“ bei Google ein und liess mich inspirieren. In Amerika gibt es so markante rote Scheunen die echt ideal sind nach zu basteln. Und dann fiel mir ein das ich ja noch solche Wackelfedern übrig hatte und desweiteren kann man mit der Eulenstanze ja nicht nur Eulen stanzen sondern zB auch Kühe wie in meinem Fall. Mehrere Stanzformen übereinander nennt man auch Punch Art. Und so versuchte ich das neue Thema umzusetzen. I entered „Farm“ in Google’s image search and hoped for some inspiration. On pictures from the US i often saw these traditional dark red barns that i found quickly on lots of pictures and that got me quickly. They should be easy to do is what i thought. Also i had some of these Wiggling feathers left that i used in a swap project before. Also the owl punch can be misused to create cows – so here we go. Farming it is. Mein Gott hab ich mich schwer getan. Dieses Thema und dazu Punch Art ist absolut nicht meins. Ich bin auch nicht 100%ig zufrieden mit dem Ergebnis. Die Karte kann man zB für eine Einladung zum Kindergeburtstag, als Gutschein für Ferien auf dem Bauernhof oder als besondere Geburtstagskarte für einen Bauern hernehmen 😉 Bei den Fenstern habe ich den Rahmen geschnitten (geht ja super gut mit dem Schneidbrett von Stampin’ Up!) und dann hinten dran einfach weiße Streifen über Kreuz geklebt. Oh man had i trouble getting this done. You can probably easily spot how hard it was as this card doesn’t at all look like stuff that i normally do. I’m also not 100% satisfied with the result. 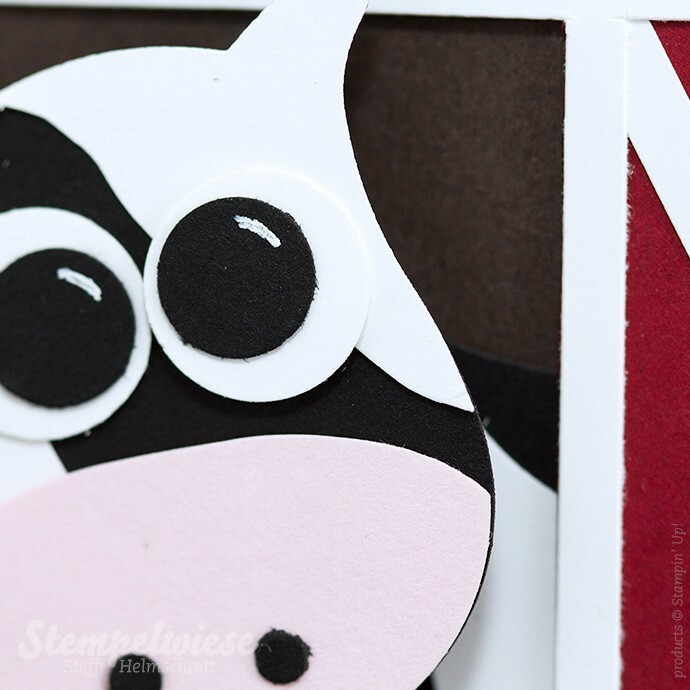 The card could be used quite generally – may it be a kids birthday or as voucher for farm vacation – probably also as a birthday card for a farmer? 🙂 I did cut the windows with Stampin‘ Up’s cutting board and glued the crossing bars from behind. Ich habe mit der Eulenstanze einmal in Schwarz und einmal in Flüsterweiß gestanzt und dann das weiße Stück auseinandergeschnitten und auf das Schwarze geklebt. Die Nase der Kuh ist Zartrosa und ebenfalls zugeschnitten. I used the owl punch to punch everything twice – in black and in wisper white. After that i splitted the white part and glued it on the black one. The nose of the cow is in pink pirouette and also cutted. Hier der Wackeleffekt von der Kuh. This video shows how the spring works for a shaking effect on the cow. My colleagues from the Design Team have many better ideas than me – look what they did. Also i’m so keen to see what youl will be doing around farms – i bet you’re doing much better than i did. Das Ergebnis und vor allem die Kuh sind toll und wirklich kreativ. Du solltest öfter Aufgaben umsetzen mit denen Du vermeintlich nichts anzufangen weißt! So creative a fun! 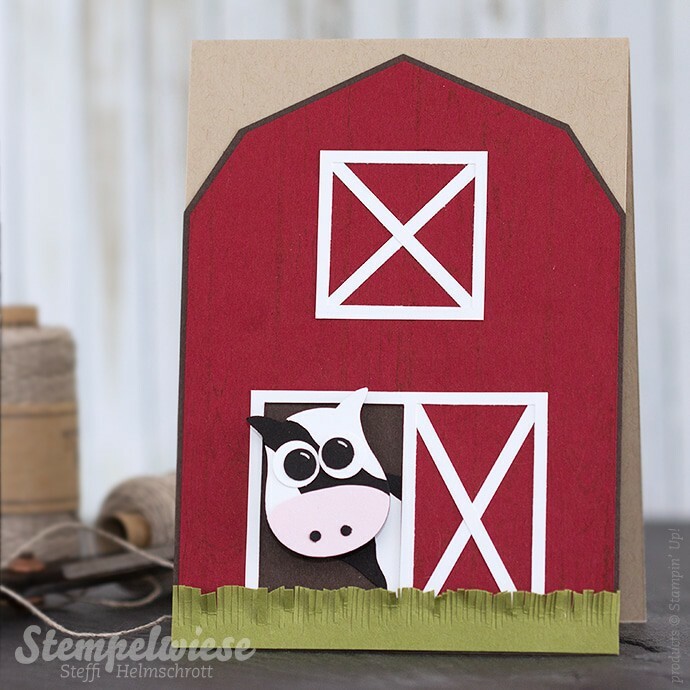 What an adorable image you’ve created with these supplies! I LOVE IT! You’ve also implemented beautifully. Thank you! Steffi, I love how this card shows your fun side. Such creative thinking and fun little surprise. hugs. How can you not be pleased with this adorable card? I think it is genius! I love the spring loaded head on the cow and would love to try that technique myself. Another awesome project Steffi! that spring head – I am dying over this!! so clever! This is just adorable! Love the barn and the punch cow. Die Aufgabe ist doch klasse erfüllt. Und Du hast sie anders gelöst, als die anderen, das ist doch auch was. Sogar noch mit Spezialeffekt. Mir gefällts, nicht zu aufwendig und mit schönem Hingucker. I am so glad that these challenges get you out of your comfort zone Steffi, because EVERYTHING you create is amazing. Just like you. The Owl punch! Amazing! Thanks for the lovely inspiration!